We’ve talked a lot about gameplay and level design on the Buildbox blog, but today we’re going to focus on the more obscure secrets of game design. Below you’ll find five often overlooked, but extremely important, factors for creating unique games that people want to play. Adding surprise and wonder to your game is a factor that’s rarely discussed, but critical for any game to achieve long-term success. It’s also the secret sauce to turning a new player into a life-long fan of your game. Surprise and wonder can help players form an emotional connection with your game. Establishing this connection is key when you’re creating a game. You want your players to fall in love with your game and keep coming back for more. Without that emotional connection, players will quickly get bored of your game, quit playing, and ultimately delete the app. As a result, your replay value and retention will be ZERO, along with your profits. However, when you add emotions and rewards into the mix you create an interactive experience that becomes memorable. Players will want to continue to explore or beat their previous score to see what rewards or special bonus is awaiting ahead. It’s all about the element of surprise and wonder when you’re trying to capture a player’s attention. You can create an emotional experience through the gameplay, characters, level design, and even with the user interface using this game design technique. Since games are an interactive media, it’s extremely easy to evoke emotion from users. Sound effects, music, character expressions; text, movement, and even color combinations can really help players connect and get into your game. Keep your game’s theme and art style in mind and brainstorm how you can add these elements in each aspect. Maybe you can add interesting sound effects or background music that compliments your game’s pace, mood, or theme. If it’s a racing game, adding a fast-paced adrenaline-pumping beat will resonate with players. If your game is an eerie platformer you can add spooky background music and creepy sound effects that play whenever an item is discovered or platform falls. It’s the small details that add surprise and wonder to your game. Characters are also powerful elements to use. You can do a lot with them. They can give your game emotional depth and serve as an effective reward system. During the game design process you can add different unlockable characters, give them animated actions, effects, and unique expressions that play into your game’s core theme. Rewards can add both surprise and wonder while emotionally connecting with players as well. Unlockable characters and unlockable items can be used to create a gratifying reward system. Coins, points and praise (an often underused type of reward) can be effective too. Praise can be in the form of text or as a sound that’s played when a stage is cleared or a bonus item is found. Animated sequences or cut-scenes can be used as well to celebrate clearing a level or as a teaser to excite players about the fun new challenges ahead. Portals and power-ups can definitely add a sense of wonder and intrigue to any game as well. Hidden portals also add massive replay value to your game. Players enjoy discovering new gateways or orbs that teleport them into a new world that they haven’t yet explored. It’s engaging and a fun surprise. Special powers in the form of power-ups or bonuses are great too. Nintendo’s Super Mario World masterfully used power-ups to add surprise and wonder into their gameplay. A great example of this is the mushroom power-up in Super Mario World. When it’s consumed it turns ordinary Mario into Super Mario, a much taller, stronger version of himself. Players are also rewarded additional points. The power balloon power-up in Super Mario World is another good example of how you can use power-ups to add surprise and wonder. When Mario or Luigi collects the balloon it makes them swell up like a balloon and float in mid-air. With game design, get creative. Make your game fun with features that will captivate players. In game design it’s essential to remember, size does matter. Bigger is not technically better when it comes to down to a game’s character size. A common mistake we see new game creators make is making their game characters too big. Your game character needs to be proportionate. Avoid making it larger than necessary. When your characters are too large it not only makes your game look unpolished and unprofessional but it also distracts players from truly experiencing the gameplay. Gaining the right perspective on this early during the game design process is key. A good way to determine if you’ve made your character size too big is to compare it to classics like Mario. You can do this by taking all of your game’s screenshots and loading them into an image editing software like Photoshop or Illustrator and comparing it against other popular games. Mario is a classic and great standard to use. You can also compare it to popular games of your specific genre as well. If you notice that it’s off, simply adjust the size and resave. One of the secrets to game design is to create universal laws for your game. These laws apply to the overall aesthetics of your game. The way your game looks and plays has a great deal to do with the universal laws that you apply. Maybe all of the buttons in your game are colored blue to match well with the color scheme and the art style that you’ve chosen. Or maybe particle effects in your game are similar for similar types of objects. There needs to be consistency so the game feels more natural and not convoluted. Try to keep the same style and corresponding theme throughout your game. Remember it’s a thin line between being creative and being tacky. The goal is make your game as cohesive as possible. Avoid mixing multiple color combinations and wild patterns together. Pick one art style and stick to it and try to use color combinations that mesh well together. Decide which laws you want to follow in your game design. Ask yourself questions like, “What is my art style direction?” “Which colors or combinations will look best with my main character or theme?” Take your time to research various color schemes, consider your options and plan it all out. If you’re not quite sure what colors work well together start by looking at the combinations used in some of the top games. Then explore creating your own color scheme using one of the many color palette and scheme tools available. To find out what looks best you can use sites like Colourlovers, PaletteGenerator, The Color Scheme Designer, COLRD, Adobe Colour CC, and Canva’s Design Wiki on Colors. Also StripeGenerator is a helpful tool to use to come up with colors and patterns. Most of these types of tools are completely free to use. There’s also color scheme generator apps that you can use such as The Color App and Coolors for on-the-go convenience. You can also find game design inspiration from browsing online. Sort through Google Images and look for interesting color combinations and patterns that speak to you. Pinterest also has a lot of color schemes and palette ideas. Following the 60-30-10 color principle rule can help you when you’re selecting a color scheme for your game design as well. This color principle works well for simple style games, but it’s not ideal for more complex games since you’re limiting the amount of colors that you’re going to use. So consider your game type when you’re choosing your color schemes. With the 60-30-10 color rule you pick one main color that you’ll use for 60% of the color in your game such as the background. Then you’ll use 30% of your secondary color. This color can be implemented in platforms or specific objects. And lastly, 10% of your accent color, which can be used as the main color for buttons, small items, details, and objects. Many of the top minimalist style games that only have several core colors, applied this principle to their game design. The familiarity factor is another vital part of game design. Your game should definitely feel unique, but it’s also good to have it feel familiar to players. Nearly all of the most successful games are based on core mechanics that have already been popular. 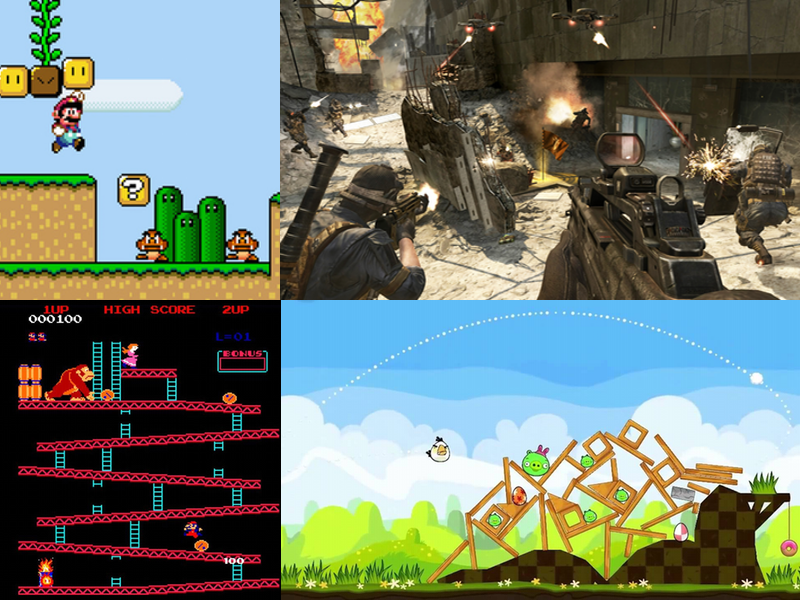 Super Mario Brothers wasn’t the first platformer, Call of Duty wasn’t the first ever first-person shooter, and Angry Birds wasn’t the first slingshot game. If you do a little research and dig deep, you’ll notice that nearly every popular game ever made has been based on core mechanics that players are familiar with. Familiarity is one of the secrets to game design because it makes your game easy to pick up. When you design your game this way anyone can start playing the game almost immediately without a lot of instruction. It’s important to design a game that’s easy to understand. You want to avoid putting them off with overly complicated gameplay. Strive to make your game unique but still familiar to players. So, how do you make a game that’s unique but familiar? The best way to do this is to use the ‘Model and Improve’ technique. This is the formula that virtually every successful app, product, and business has used to find success. There’s three basic steps to modeling and improving on a game concept. The first step is to research. Examine the App Store and look at all of the top games that are similar to the type of game that you want to make. Write them all down. The second step is to analyze the games and figure out what aspects of each game are working and which are not. Download and play all of the games and take notes. Write down anything that grabs your attention about the game. Pay close attention to all of the different elements of the game from the user interface, characters, backgrounds and gameplay to small details like sound effects, Ad placement and monetization tactics used. The third step is to take all of your findings and brainstorm new ways improve on the game concept. This can involve adding, substituting, removing or all three. Think about what feature or element you could add or swap out to make the game better. Consider different improvements or changes that could be made in every area of the game. Keep brainstorming until you have a completely new game concept that’s unique but familiar. FUN FACT: The first true platformer game was Nintendo’s Donkey Kong released in July 1981. The final secret to game design is finding that perfect balance of difficulty, challenge and enjoyment. All great games have nailed this perfect balance, or as we like to call it the ‘Zen Balance’ factor. Classics like Super Mario Bros, The Legend of Zelda, and Sonic the Hedgehog are all good examples of this. Try to think of ‘Zen Balance’ in game design as a scale. On one end you have a boring easy game and on the other end you have a very difficult to beat game. The goal is to design your game to be somewhere in the middle. When you accomplish this, you’ll have the perfect balance of excitement which will keep your players engaged longer. Often new game creators tend to focus too much on one end of the scale. They either make their game too easy or too difficult. Neither is fun for the player. You don’t want to design a game that’s so easy it quickly becomes boring or so difficult that it’s not fun to play. Unfortunately, it’s pretty easy to make this mistake especially when you’re the only one testing your game. The problem that many creators have is that they get to know their game too well so when they try to test it themselves it’s hard to pinpoint accurately how challenging their game actually is. This is why testing with beta testers is so important. It’s the only way you can truly determine where your game measures on the ‘Zen balance’ scale. Try to always test on multiple types of people, to make sure your game has the right level of difficulty. Remember to use surprise and wonder to help your players build an emotional connection with your game. Try to keep your character sizes in-check and be sure to make your game’s universe as cohesive as you can. Your game concept should feel familiar but unique. And always test rigorously to find that perfect ‘Zen Balance’ of difficulty within your game. All five of these techniques are the key to solid game design and the secret to success. Surprise and wonder. That’s the real secret sauce. But it’s a secret! It’s like saying a song has to have a really good hook. Yeah ^, It’s greatly appreciated and this kinda insight is valuable to those who know how to use effectively use these techniques. thanks for sharing. we have always been impressed with not only the quality of info you share but your willingness to share the tools you use. Looking forward to use and evaluate for afterschool program enrichment. Previous users of Gamemaker, Kudo, Scratch, Minecraft and Unity.